Fees are determined prior to the start of the season and are based on the results of our summer fundraiser. The 2015-2016 season fees were $450 for skaters and $225 for goalies. There are two travel tournaments per year (one during the season and one summer tournament). These are not included in the yearly fee as not everyone can make these tournaments. Price is usually around $60 per player plus travel/hotel fees for tournaments. All coaches and players must register on line prior to the try outs. You must be registered with USA Hockey before you step onto the ice! The Rhode Island Panthers Senior D Women's Team are the 10th Annual St. Valentine’s Day Have a Heart Tournament Champions!! RI Panthers Senior D Team Wins the First Annual “St. 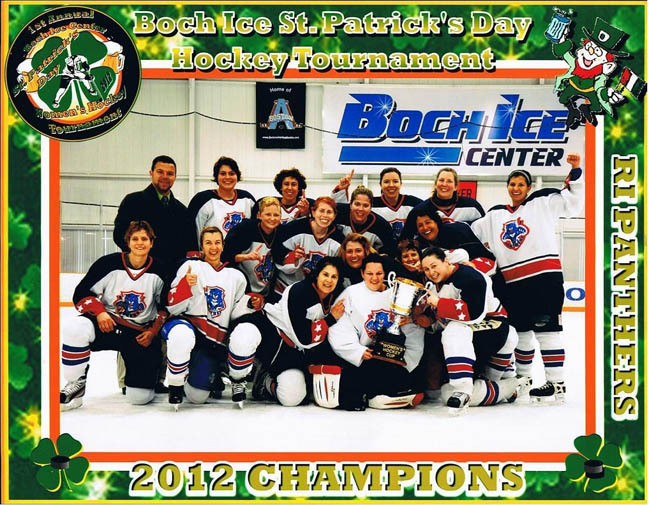 Patrick's Day” Tournament in Dedham the week of March 23-25.